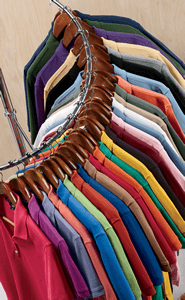 Threadfast Apparel used a bit of moxie to land themselves in the center of the retail arena. Their innovative fabric blends and configurations aren’t just modern and sleek, they are comfortable, printable, and eye-catchingly popular. For over 25 years, they have produced garments using quality materials that are sourced and assembled with uncompromising standards of social and environmental responsibility. Headquartered in the fashion district of NYC and designed in Southern California, Threadfast Apparel brings together the best of both coasts. If you want the body of your designed apparel to be the best and boldest, you won’t need to look much further than Threadfast Apparel to find new favorites. Their popular Men's Blizzard Jersey Short-Sleeve T-Shirt challenges the notion of polyester as a comfort fabric, while also presenting an impactful marbled yarn that looks great by itself and will only enhance your printed artwork. For a high-end feel at a t-shirtwholesaler.com price, tri-blend French terry, raglans and t-shirts have been engineered to a perfect ratio of poly/cotton/rayon that looks classic, feels amazing, and won’t break the bank. Not to be outdone in everyday sporting apparel, Threadfast Apparel's jersey and spandex has been crafted into workout-ready racerback tank tops that are form-flattering, yet have extended flow and recovery to ensure you won't outwork them. The Unisex Cross Dye Short-Sleeve T-Shirt has been uniquely dyed to offer subtle luminous colors that seem to change when seen from different angles in the fabric, while being versatile enough to be a great looking t-shirt for both men and women. Additionally, they have taken lightly textured slub, perfectly-worn vintage and true-color pigment-dye processes and worked all of these into unique creations in classic formats, appealing to customers and ready to receive your elevated level of imprinting.